- 2017 Aliner Scout "Lewis"
- 2017 nüCamp T@G XL Max "Belle"
- 2017 nüCamp T@G XL Max "Anastasia"
- 2017 nüCamp T@B S "Phillip"
- 2017 Forest River R-Pod 176 "Trevor"
- 2017 Forest River R-Pod 179 "Kermit"
*ALL RENTALS REQUIRE A 3 NIGHT MINIMUM. Princess Craft RV is closed on Sundays so our employees can spend time with their families. Therefore, campers may not be picked up or returned on a Sunday. Pick-up and Drop Off appointment times range from 9am - 3pm, Monday through Saturday. Please schedule at least 30-60 minutes to learn about your camper at your pick up appointment. When you return, we perform a thorough check out of the trailer. This will require about a 30 minute appointment for returns. 50% of the rental amount is required to reserve a trailer. The remaining balance must be paid in full 30 days prior to scheduled pick up. Princess Craft RV will deliver & pick-up a rental trailer to a campground site within 25 miles of our location for a fee of $200. The customer is responsible for reserving the site. Princess Craft RV will set up camper, level jacks, and hook-up sewer, electrical, and water. 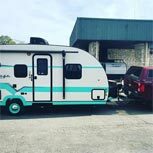 - If you need Princess Craft RV to install the necessary equipment on your vehicle you MUST make a separate appointment. Renter must provide proof of insurance for the vehicle towing the camper and renter liability form signed by the agent. Includes sewer hose, chemicals, adapter & ½ hour walk through to familiarize you with your trailer. All trailers will have a full propane tank, some water in the tank, and fully charged batteries. Generators will have a full fuel tank, but you may require additional fuel depending on your use of the generator. Rental trailer black and gray tanks must be emptied and rinsed prior to return of the unit. If the tanks are not dumped, a $250 fee will be charged. Fresh water tanks do not need to be dumped. Pets may be allowed in our trailers (pet fee of $50 applies). If cleaning is required to remove pet hair, pet smell, or any sign of a pet, $50 cleaning fee will apply. The trailer must be returned as clean as when it was rented or there will be a $50 cleaning fee assessed. If you would like us to clean the trailer, a $50 cleaning fee can be pre-paid at the time of rental. No smoking is allowed in any rental trailer. If there is any sign of smoking, a $250 cleaning fee will be charged. A proper towing setup is required to rent our trailers. Towing packages for your vehicle can be purchased and professionally installed by our service department. Please contact us for information, pricing, and to schedule installation. The propane tank(s) for your trailer will be full at the time of rental. You do not need to have them refilled when you return the trailer.